I read this book by Jennifer Hunt. I loved this book. I'll tell you more about this book... but only when I'm done writing my book. 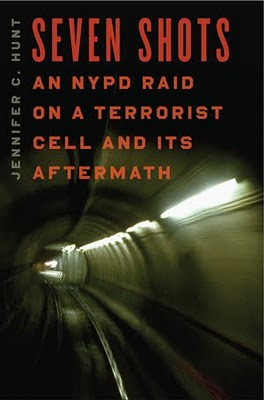 On July 31, 1997, a six-man Emergency Service team from the NYPD raided a terrorist cell in Brooklyn and narrowly prevented a suicide bombing of the New York subway that would have cost hundreds, possibly thousands of lives. Seven Shots uncovers the stories, rivalries, and human beings behind the New York City police officers who defused the subway bomb attack that foreshadowed September 11th. With unparalleled access, Hunt uncovers the never-before-told stories of heroism, September 11th, and petty rivalries that drive and destroy life in the NYPD. This is a true-life crime story that shows, warts and all, the unrequited love of good police officers toward an organization that doesn’t love them back. At times gripping, tragic, and theoretical, Seven Shots penetrates deep into the police world. Seven Shots vividly brings me back to my own policing days with laughs, tears, excitement, and adrenaline-filled moments of sheer terror. A groundbreaking, page-turning work. It's a great book and a wonderful ethnography with amazing insight into the police culture. Plus it tells a story about a big bomb that almost wan.